On DDD Guy stops by a place and they create a steak salad. The salad comes complete with fries, croutons, steak, ranch dressing and cheese crumbles. I thought that sounded intriguing so I set out to create my own vegan version. 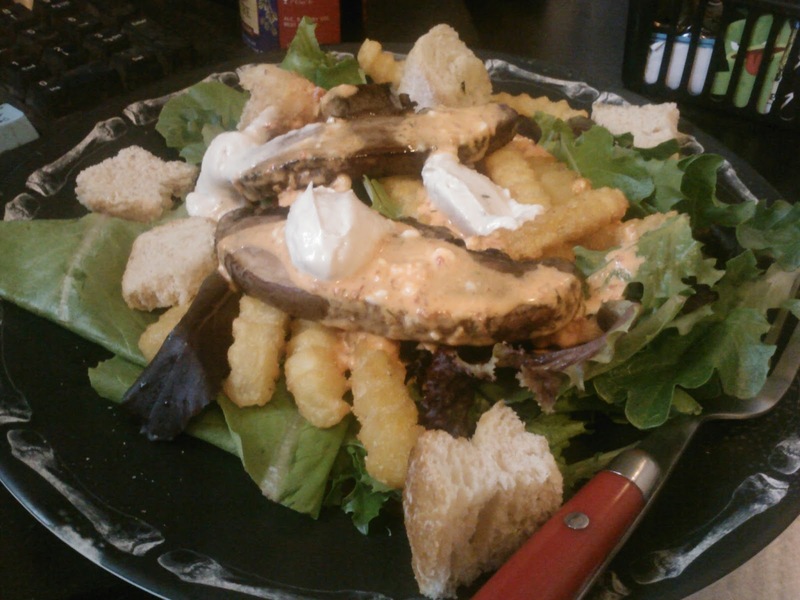 I used an organic lettuce blend as the base, topped it off with oven baked fries (with a Johnny Garlic's twist: nooch, garlic and pink sea salt sprinkled on top), homemade basil croutons, portobello strips marinated in: vegan worstisheir sauce, spices, liquid smoke and Braggs, habanero ranch dressing and some spicy cultured cashew cheeze I bought from Whole Foods. I had more veggies to use that day but I forgot them! I hate when that happens. It was a great salad, even for a mushroom dislike-r like myself it was tasty and good. I could have used vegan steak strips but wanted to try something new!Salads do not have to be all wimpy - if only every restaurant had a vegan salad option like this! Great vegan spin and one hearty salad.Dig the mix of Braggs, liquid smoke and then the habanero ranch dressing too.Nice! I never knew salads could come under the comfort foods category until I saw your hearty salad here. Yummmmmm! I'm glad I'm not the only one who watches DDD! The meals they show are maybe the most non-vegan meals on the planet so it's always fun to try and veganize them. You did a fabulous job. And yeah, this salad is definitely comfort food! Never thought I would say salad and comfort food in the same sentence LOL!